Pike Place Market‘s neon sign and clock backdropped by a typical grey and cloudy Seattle sky. That’s the first thing that comes to mind when I think of Pike Place Market. Not golden Rainier cherries blushing with rouge; nor freshly-foraged morels hiding under a light dusting of dirt; or, the blinding flash of silver-skinned salmon soaring overhead. I first encountered Pike Place Market in 1992, a year of many firsts. It was my first time in Seattle, and in the United States. It was my first autumn. It was my first year at the University of Washington. Everything was frighteningly foreign and excitingly new at the same time. I was attending day one of the international students orientation organized by FIUTS (Foundation for International Understanding Through Students, it’s a great organization btw) and a trip to Pike Place Market was on the agenda. Besides a hike to the Ice Caves, the market excursion was one of the highlights of the weeklong orientation. That morning, I was nodding off during most of the presentations thanks to jetlag and also because they were, quite frankly, boring. After lunch, a group of us headed downtown on a Metro bus: Annie, our soft-spoken group leader from Taiwan; Sabine, a German Claudia Schiffer lookalike, all blond hair and mile-long legs; Top, a Thai guy who went everywhere with his camera slung around his neck; Yuki, a bubbly Japanese girl with curly—very curly—hair; Luwei, a smart and sassy Indonesian; and Hsin, a Singaporean gal who became one of my best friends. 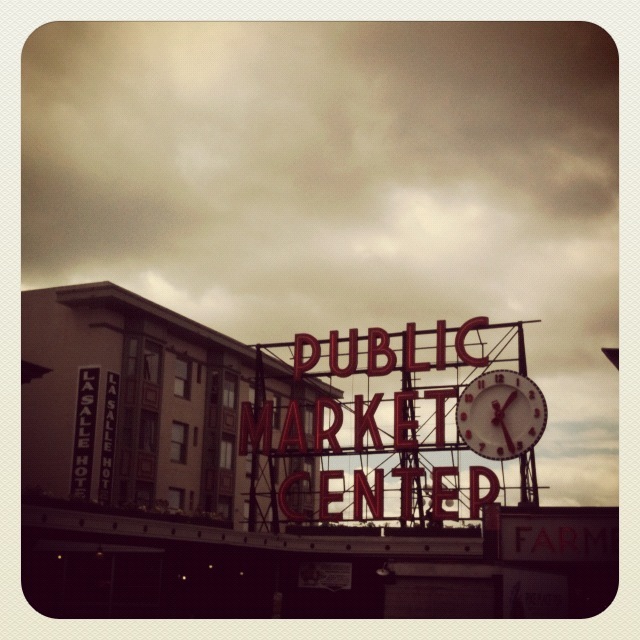 We dropped off at Westlake Station and Annie told us our first stop was Pike Place Market. I didn’t know what to expect. In Singapore and Indonesia, markets were wet, dark, dirty places teeming with crooked vendors, squawking chickens, and foul odors. They weren’t my favorite places, let alone tourist attractions! As we approached the market heading west along Pike Street, the “Public Market Center” sign loomed in the distance. As we drew closer, my eyes grew rounder and my jaw dropped. People were snapping photos left, right and center and everyone seemed more interested in browsing than bargaining. The market was sparkling clean (relatively speaking) and the only aroma my nose sniffed out was that of summer’s last chance peaches mingling with the fresh sea scent from Elliott Bay. I stopped to pet Rachel the Pig. I jostled with the crowds watching grown men play with fish. I marveled at the glorious blooms grown by Hmong farmers. I oohed and aahed at peaches, apricots, squash, Brussel sprouts–all fruits and vegetables I wasn’t accustomed to seeing at a market. As we were wandering the market, I spotted a stall selling deep purple, almost black, oval orbs with wrinkly, leathery skins. Prunes! I don’t know about you but when I travel I always have issues with you-know-what so I lingered, perhaps hoping to absorb the fruit’s magical properties via osmosis. 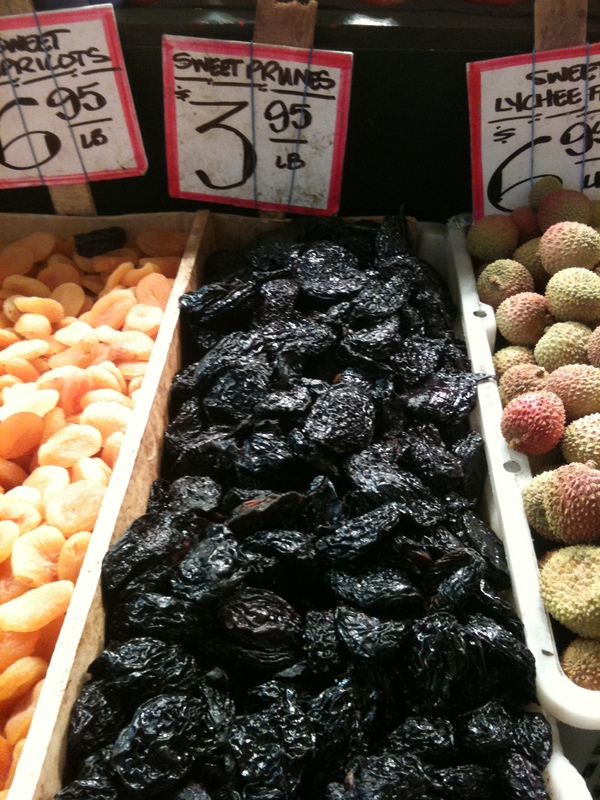 Prunes and lychees together at the market, what a juxtaposition! I hesitated to open my mouth. Just the day before, I had an embarrassing (if only-to-me) kerfuffle at the University Bookstore. I had asked the sales person if they sold “cohk boahds” in my British-inflected English and I repeated myself several times before I realized what I was doing wrong. I wasn’t pronouncing my ‘r’s. “Corrrrk boarrrrd,” I trilled. Only then did her eyes register a flicker of understanding. Who knew English could pass for a foreign language? I took a deep breath, pointed to the prunes and squeaked, “Half pound please.” Then I grabbed the brown paper bag held out to me and shuffled off in a hurry. I dug into the bag and brought a prune to my lips. I was so startled I stopped to a halt. This was not the rubbery-medicinal- Sunsweet-supermarket kind of prune I was used to. This prune was pillowy-soft and tasted of sunshine and sugar. It had obviously spent its last days happily basking in the sun, concentrating as much of its pluminess/pruniness as possible. By the time we left the market, only seeds remained in the brown bag as evidence. I enjoyed those prunes immensely, and needless to say, I achieved my initial goal. 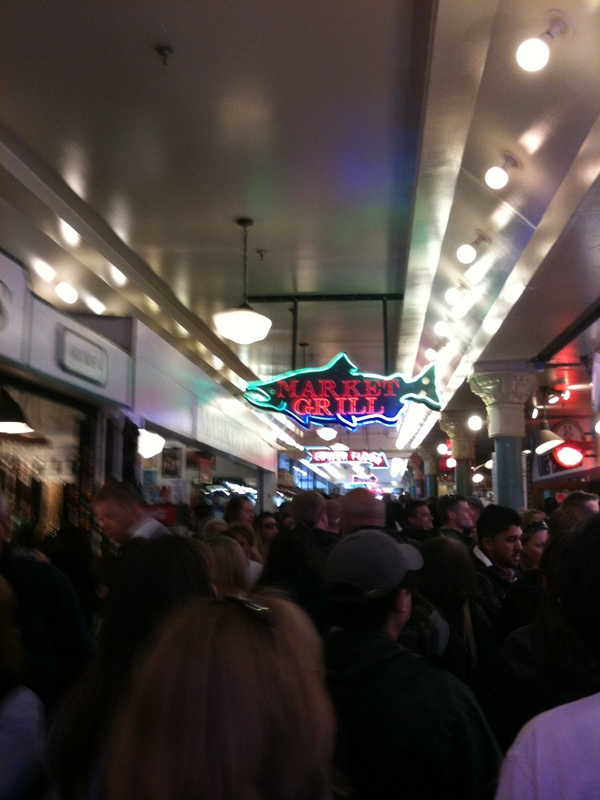 It’s been 20 years since my maiden encounter with Pike Place Market. Since then, I’ve returned to the market again and again, and brought home salmon, strawberries, tulips, Dungeness crab–all the bounty the Northwest has to offer. They’ve all been fresh and fabulous. But it’s only prunes that I always make a beeline for, if not for nostalgia’s sake then just because. This post is dedicated to my friend Jess Thomson (yes, this is a disclaimer, I know the author) and her new book Pike Place Market Recipes (Sasquatch Books, May 2012). Jess compiled 130 fresh recipes, many from market vendors and restaurateurs, and tossed in smart tips and tricks for utilizing the varied products the market has to offer. For everyone who’s had the pleasure of visiting Pike Place Market, it’s a wonderful way to bring the market home with you, whether you visit every week or once in a lifetime. I wish I could share a recipe with you but there are no recipes using prunes in the cookbook (I know, whaa?!). But what I can do is share Jess’s cookbook with one lucky winner. 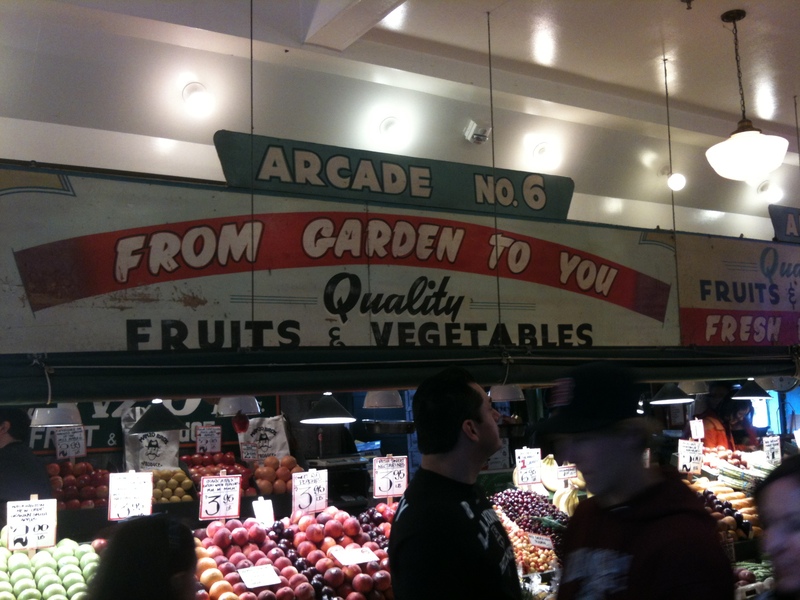 Do you have memories of Pike Place Market, or how ‘bout them prunes? Just leave a comment and I’ll pick a winner through some complex randomized system, or just by eeny meeny miny mo-ing. Winners will be announced on June 30th! Hi Laura, I’m so glad you associate two wonderful memories with the Market. It makes it an even more magical place! Thanks for participating! Hi Martha, I think Seattle is at its most beautiful at the end of summer and early fall. And yes Copacabana Cafe is a hidden little gem (not many people know about it) yet it offers a fabulous view of the market. Thanks for participating! Hello everyone, the winner of Jess Thomson’s “Pike Place Market Recipes” is Ann Mah! Congratulations! Love your blog Pat. I have two memories: On one of my first trips to the market during a visit to Seattle before I moved here I was introduced to kumquats – was amazed that one ate the skin and all – but greatly enjoyed the leathery, tangy sweetness that evoked the tropics, despite the gray sky and cool air. The second was the day after my doctoral defense, I was 8 months pregnant and my two favorite aunts took me down there, strolled with me, bought me sweet treats and a hand-knit baby hat…it was so fun to spend time with them and be a little bit spoiled in celebration of those two very special events in my life! What beautiful memories of your first trip to a special market. I’ll never forget my first visit to a wet market in Hong Kong — particularly eye-opening after growing up in the sterile Southern California suburbs. Our order of chicken was slaughtered to order — and I discovered what shrimp looked like swimming! Hi Ann, a visit to a wet market can be quite a shock to the system if you’re not used to it. I used to drag my feet every time my mum took me “marketing,” that’s what she called it. But upon reminiscing I miss those days, not just the sights, the scents, and the sounds, but the whole experience of spending that hour or so cruising through the market with my mum. Congratulations, I’ll be in touch! Woo-hoo! I just found your blog and already there is a giveaway! Sadly for my I have visited Pike Place Market only once. I have always planned on going back but since I moved to NYC I have not gone back to the West Coast. Hi Judith, once is all it takes for Pike Place Market to leave its imprint on someone. I hope you get another chance to visit our beautiful city and the Market! Thanks for participating! Ahh…great one Pat! 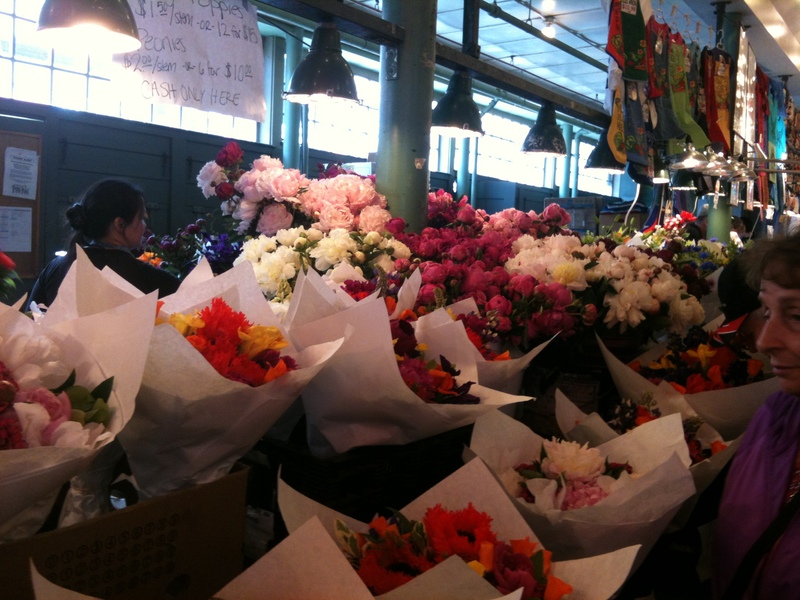 I love the market and one of my favorite memories is from the end of my first summer living in the city. It involved sitting above the street at Copacabana Cafe and snacking on various tapas with friends, on a sunny summer Seattle day…..watching the hustle and bustle from a delicious little sanctuary was lovely!